It all began with a '49 Chevy pickup that Ed Lipinski learned to drive on when he was 12 years old. Today, Lipinski owns a Watson, Minn. company called E-Z Chassis Swaps. He manufactures easy-to-build kits that help hobbyists mount old pickup truck bodies on newer chassis. Lipinski grew up with an interest in cars and a desire to build hot rods. He had an aptitude for drawing and his mother talked him into going to school for drafting, rather than auto body repair. He attended Granite Falls Vo-Tech and earned a degree in drafting and design. He then went to work for Montevideo Technology, Inc., where he spent 26 years designing tools and motors. In 2006, Lipinski was laid off from work. That's what prompted him to combine his design talents with his car building desires and start E-Z Chassis Swaps. But, then he went to work for Fagan Engineering in Granite Falls, where he spent seven years before another lay-off came. At first glance this E-Z Chassis Swaps promotional vehicle looks like a completely restored 1949-1954 Chevrolet Advance-Design short box pickup truck. These popular commercial vehicles were Chevy's first postwar trucks. The Chevy half-a-truck promotional vehicle was prominently displayed at the 2016 Iola Car Show. This selling tool is so detailed that it even has a taillight on one side and a chrome plated exhaust pipe extension. This development convinced Lipinski to make E-Z Chassis a full-time business. He designs the chassis swap kits and has them manufactured by sub-contractors in Minnesota and South Dakota. Granite Falls Coating does the powder coating of the parts. 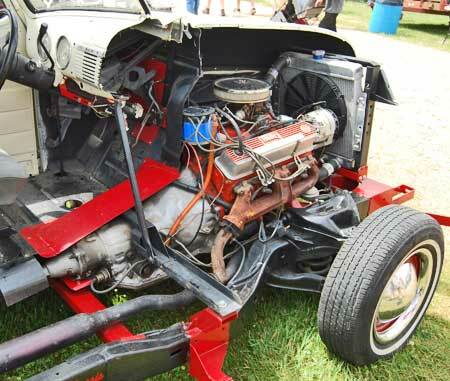 Lipinski's most popular kit allows a 1947-1954 Chevrolet or GMC body to be mounted on a Chevrolet S10 pickup chassis. 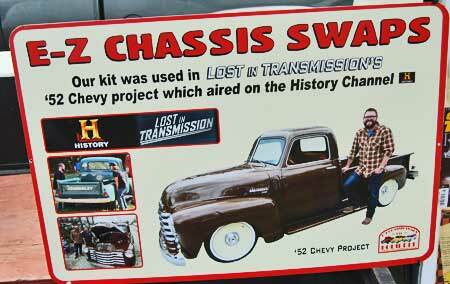 He also makes a second kit that permits a 1941-1947 Chevrolet pickup body to be mounted on an S10 chassis. A more recent design involves mounting late-1955 to 1959 Chevrolet pickup bodies on a full-size Chevy truck chassis or a 1978-1996 Caprice chassis. The show vehicle features an original early postwar Chevy pickup body on a reconditioned 1984 S10 pickup chassis that is fitted with a small-block Chevy overhead valve V-8. Finned Holley rocker covers are a hot rod touch. 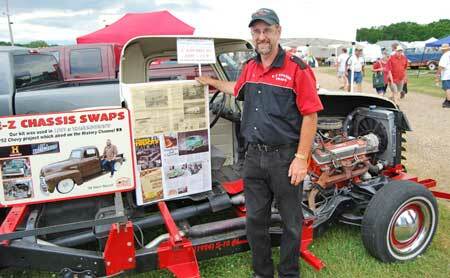 Ed Lipinski of E-Z Chassis Swap shows off an article written about him and his company in an area newspaper. Two lay-offs in less than 10 years prompted Ed Lipinski to go into manufacturing chassis kits on a full-time basis. The conversions utilize many parts from the chassis-donor vehicles that make the finished product easier and safer to drive. More power, better braking, greater safety and improved ride quality are some advantages of a chassis swap. Lipinski's kit was used in a cable TV show called "Lost in Transmissions" on The History Channel. 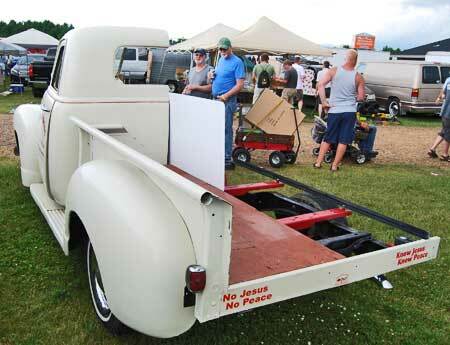 The truck built in that case was a '52 Chevy pickup on an S10 chassis. That particular kit sells for $1,595 plus shipping and handling. Other kits cost up to $1,695 for a late-'55 Chevy or GMC pickup with a long box. The Made in the USA kits allow the older bodies to be installed on the newer frame by either bolting or welding components together. Only basic mechanical skills are required to do a chassis swap. The kits provide the mounts that adapt other done-truck parts, including the steering column, wiring and brake system. Builders can put together a chassis and cab and then add their own fenders and cargo box. 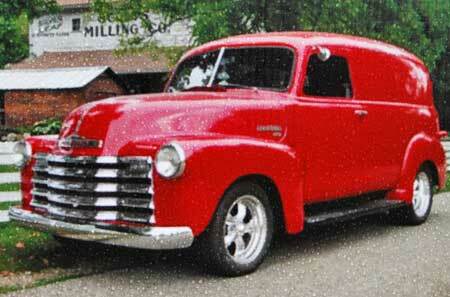 There are two-wheel-drive and four-wheel-drive kits, as well as a kit for the 1957-1954 Chevy panel delivery truck. The 1947-1953 Chevy short box pickup kit offers stock height or two-inch drop options. The stock height option adds $50. Motor mounts are available for a Chevy 4.3-liter V-8 or a small-block Chevy V-8. E-Z Chassis also offers a Custom Turn-Key Chassis for people who don't have the time to build a truck or don't feel confident about their mechanical skills. In this case, the price is $3,995 for a S10 chassis that's blasted and painted and includes a prepared S10 steering column, pedal assembly, gas tank and required wider 4x4 rear end. This choice is available on a limited basis. Turn-Key Chassis has a $3,995 price for a S10 chassis that's blasted and painted and includes a prepared S10 steering column, pedal assembly, gas tank and required wider 4x4 rear end. This choice is available on a limited basis. Caprice Kit choices are currently limited to the '55-'59 Chevy short box pickup for $1,695 plus shipping and handling. However. a '55-'59 panel delivery truck kit for the same price is in the development stage. The promotional vehicle really allows Ed Lipinski to show potential buyers what they can get in their E-Z Chassis kit. Lipinski told Second Chance Garage that business is good. There is also a Universal Kit for owners of Ford, Dodge, International, Studebaker and other trucks. It has the basic mounts for installing 1940s and 1950s pickup bodies on the S10 chassis. It retails for $995, plus shipping and handling. Here again, two-wheel-drive and four-wheel-drive versions can be built. E-Z Chassis currently makes a chassis swap kit for the Advanced-Design style Chevy/GMC panel truck. and is working on a second kit for the 1955-1959 Task Force panel. The kit shown is offered with a 3-in. or 4-in. chassis drop. Lipinski's kit was used in a cable TV show called "Lost in Transmissions" on The History Channel. 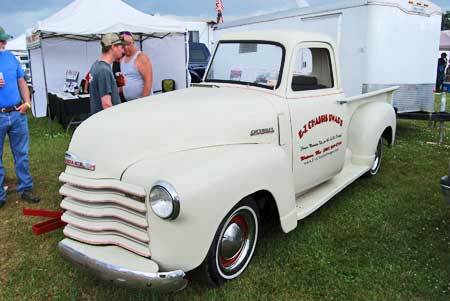 The truck built in that case was a '52 Chevy pickup on an S10 chassis. That particular kit sells for $1,595 plus shipping and handling. Five Future Kits are also in the works. The first is for 1937-1940 Chevy short box pickups on the S10 chassis; the second is for 1948-1952 Ford F-1 short box pickups on the S10 chassis; the third is for 1955-1959 Chevy and GMC short box pickups on a Tahoe SUV chassis; the fourth is for 1960-1966 Chevy and GMC short box pickups on the Caprice chassis; and the last is for 1960-1966 Chevy and GMC long box pickups on the 1973-1992 Suburban chassis. Second Chance Garage ran into Ed Lipinski during the 2016 Iola Car Show (www.iolacarshow.com) where he was using an unusual promotional vehicle to show off his wares. He had half of a restored 1949-1964 Chevrolet Advanced-Design pickup truck body sitting on one of his Turn-Key S10 chassis. It was an attention getter. For additional information visit www.e-zchassisswaps.com or call (320) 226-2768 or (320) 269-8769.